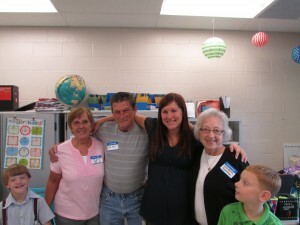 Today your child learned about a project that they will be working on at home with their families. Your child should have brought home a piece of scrapbook paper today. On the scrapbook paper, please help us get to know your child and your family a little better. 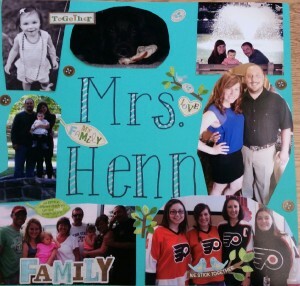 You can use family pictures, drawings, decorations, stickers, labels or any other creative touches you would like. Each student will share his or her page with the class. We will then display the pages in the hallway. Make sure your child’s name is on the front of the paper. Please return your project by:Friday, September 9th. Thanks for your help! If you have any questions or concerns, please do not hesitate to contact me. I have added a picture of the one I made for you to use as an example. Grandparents’ Day is Sunday, September 11th. Our class would like to celebrate this special day by inviting our grandparents to join us for a special “tea” in the classroom. Grandparents will be invited to tour the classroom, listen to a story, help their grandchild with a craft, and enjoy some light refreshments. This is a great day to celebrate grandparents* and all the wonderful things they do! *If your child does not have grandparents to invite, or any that live close by, they may invite another family member/friend from that generation. Sorry parents! We’ll invite you in another time! We had a fantastic first day of school! It was so great meeting all of the new second graders! Everyone did such a great job at school today. We got to know each other a little more, learned our school and classroom rules and learned more about being in second grade! Tomorrow, your child will meet his/her language arts teacher. Parents, please take a minute to complete our quick Second Grade Survey. The survey allows all of the second grade teachers to have a little more information about you and your child. Please click here to access the survey. Thank you for your time! I cannot wait for our second day of second grade! The second grade teachers work as a team to ensure success and a great year for all students. For this reason, we have created a survey to help us get to know you and your child. Please click here to complete this survey. Thank you for your time!